I truly believe in using food, exercise, and things from nature to heal the body. I saw a non-surgical specialist a month ago, and was ready to go in for cervical facet joint steroid injections. One of the things I had to do was quit taking Fish Oil 7 days prior, so on Monday, July 31st I did just that. I was still experiencing pain through that week. On Saturday, August 5th I read an article by Donna of Fed Up with Fatigue about 30 Low Cost Fibromyalgia and Chronic Lyme Treatments. 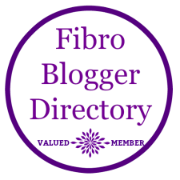 (Major shout out to Fibro Blogger Directory and the Friday article link-ups!) The second item on her list was magnesium malate that she said “helps to reduce my pain levels, soothes my restless legs, improves my sleep, and keeps me regular.” So I read the reviews, bought a bottle, and took a pill that night. It’s a Miracle, I Say! On Sunday, August 6th I noticed that I didn’t have the pain or numbness in my right arm and shoulder. A few days later I quit taking gabapentin (I hate taking medication if I don’t have to). Still no pain. I started doing yoga and pilates every day (following along with the #30DayPilatesBody challenge from Robin at TheBalancedLifeOnline.com) coupled with the physical therapy exercises for my shoulder, hips, and back. I have been very conscious about my diet and water consumption as well these last three weeks. While I did aggravate a hip problem I have (or maybe created a new one) when I was feeling good one day and tried a high-intensity work out on day 4 of the 30 day challenge, overall I have been relatively pain free and able to function again. I have lost 6 lbs. I am sleeping great and not waking up in the middle of the night in pain. I have not missed a work out in over a month now. (Insert happy dance!! ❤ ) I truly believe in using food, exercise, and things from nature to heal the body. This approach has worked fairly well for my fibromyalgia, and I find when I stray from this approach, I flare! While it has been a welcome relief to not be visiting doctors, taking more tests, and crying in pain, I still would like to know what was wrong. Was I deficient in magnesium? I do eat a lot of foods that are magnesium-rich. It is difficult for me to believe that what I was feeling (some of my symptoms highlighted below) was a result of a lack of minerals in my body, but I suppose stranger things have happened. Another cheap and easy way to get magnesium is to soak in an Epsom Salts bath. One of my favorite bath salts is Dr. Teal’s Epsom Salts (regular, pink Himalayan, or lavender). All in all, things are looking up and I feel like progress has been made. While I wish I hadn’t spent all of that time and money on tests that gave me no answers, I can’t regret trying the traditional route of seeking a diagnosis. I am considering finding a doctor who specializes in functional medicine to see if I can get some answers. Have you been to a holistic or functional doctor? Have you ever experienced something similar with mineral deficiencies? Please share your experiences! Cynthia, I’m so glad to hear you’re finally getting some much-needed relief. Thanks for sharing the Magnesium info. I’ll definitely be eating more pumpkin seeds! Have a great weekend! You’re welcome! And I hope you have a great weekend too! !